On May 22, 2013, The Chicago Board of Education voted to close 50, “turn around” five, and co-locate 17 elementary schools. 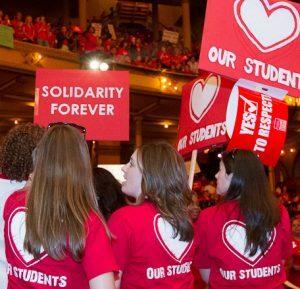 Faced with widespread opposition to these actions, CPS promised hundreds of millions of dollars in capital improvements and transition supports for schools receiving students from closed schools. However, CTU’s examination of the evidence finds that the promises made to receiving schools were hollow in many cases and only partially fulfilled in others. On December 28, 2011, Simon Guggenheim Elementary School paraprofessional and homeless education coordinator Sherri Parker received an alarming call from one of her students’ parents. The student’s mother informed Parker that shortly before Christmas, the school had called her and recommended she transfer her child to another school. On the West Side, Jacob Beidler Elementary faced similar worries. In 2011, CPS announced its intention to close the East Garfield Park neighborhood school and hand its building over to a charter school. The turnaround model is not about educational improvement. 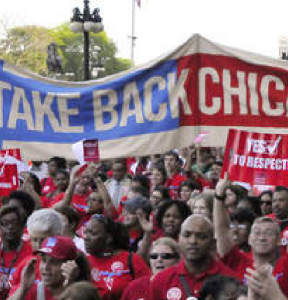 No study has ever shown that firing and replacing an entire school staff, from the teachers to the clerks and lunchroom attendants, has any positive impact on student learning, Chicago Teachers Union (CTU) reports.